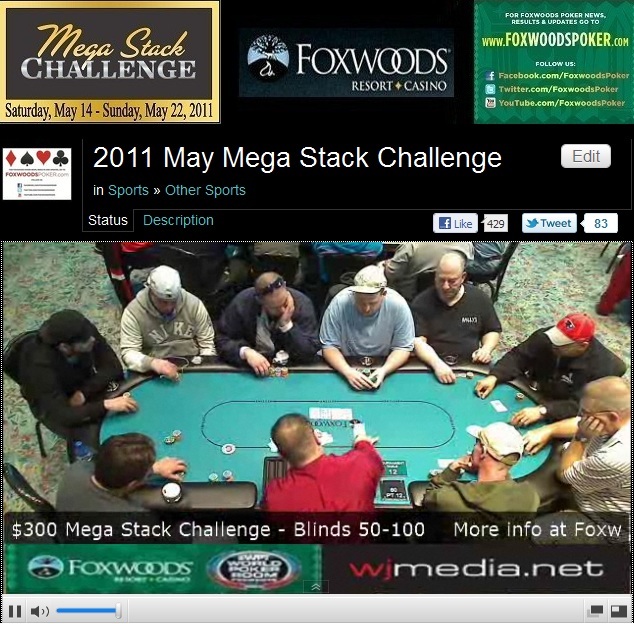 The players in the $300 Mega Stack Challenge are now on a 10-minute break. With 55 players remaining, the average chip stack is now 203,000. $300 Mega Stack Challenge Now in the Money! The money bubble just burst in the $300 Mega Stack Challenge. The 80 remaining players are now guaranteed at least $637. We are now down to just 97 players in the $300 Mega Stack Challenge. The final 80 players will finish in the money. The blinds are now 2,500-5,000 with a 500 ante and the average chip stack is 115,000. $300 Mega Stack Challenge Now Streaming Live! The players are back from dinner break and play has resumed in the $300 Mega Stack Challenge. The blinds are now 1,5000-3,000 with a 400 ante. There are 168 players remaining. There are 168 players remaining and the average chip stack is now just over 66,400. The blinds in the $300 Mega Stack Challenge have been increased to 800-1,600 with a 200 ante. With 290 players remaining, the average chip stack is now just under 38,500. The top 80 spots will finish in the money. With 499 players remaining, the average chip stack is now just under 22,400. We had a total of 744 players in the $300 NLHE Mega Stack Challenge event. The players in the $300 Mega Stack Challenge are on their first break of the day. The final numbers and payouts will be posted as soon as they are made available. The blinds in the $300 Mega Stack Challenge have been increased to 75-150. There are now over 700 players registered for today's event. The $300 Mega Stack Challenge is now underway. Players started with 15,000 in chips and the blinds are currently 25-50. Levels are 30 minutes in length. There are already well over 500 players registered for today's event. $300 Mega Stack Challenge Kicks Off at 11am! The $300 Mega Stack Challenge is set to kick off at 11am EST. Registration will be open for at least the first two levels. There are already over 370 registered for today's event!